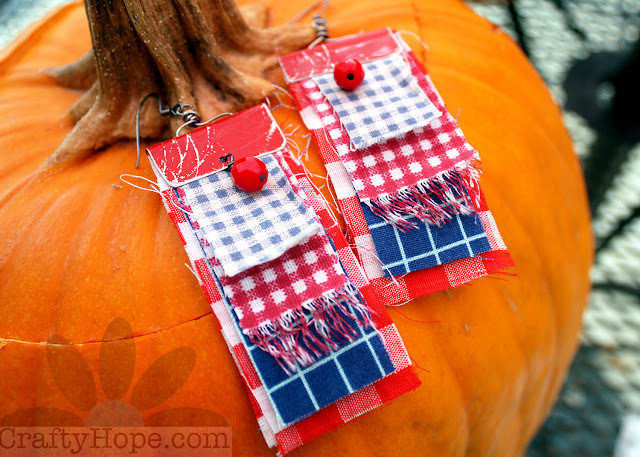 Erin offered up Plaid as the inspiration for the We're All Ears Challenge at Earrings Everyday. Initially, I had zero ideas for this challenge, but I really wanted to force myself to get over that hump. While using the free, fast internet at a local coffee shop to upload a few videos, I made myself brainstorm designs for the challenge while waiting. I began by re-reading what Erin wrote regarding plaid. One of the points that stood out was that plaid is technically a fabric, but tartan is the pattern. So, I knew fabric had to be included. Once home, I raided my small fabric stash and discovered an obvious palette. Seriously, I found five plaid fabrics and four of them were combinations of red, white, and blue. I was lucky enough to have a red piece of tin right on my desk. One of my sketches included a stack of fabrics topped with a piece of tin. I thought it would be easy enough to complete the design. I didn't initially factor in the measuring, exact cutting, and ironing of the fabrics, but it finally all came together. These earrings scream of Fall to me. 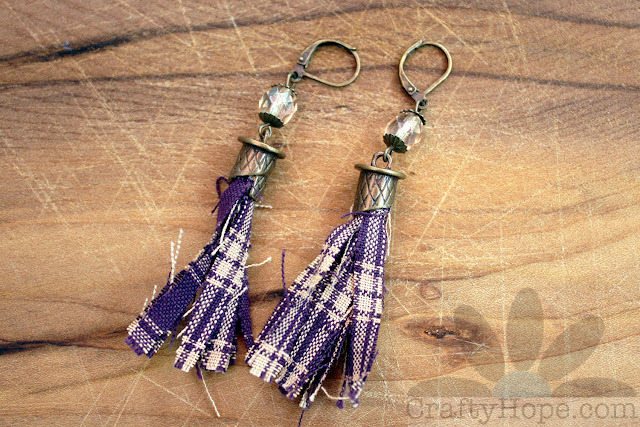 They make me think of bonfires, hayrides, corn mazes, and cozy gatherings - just like plaid should. 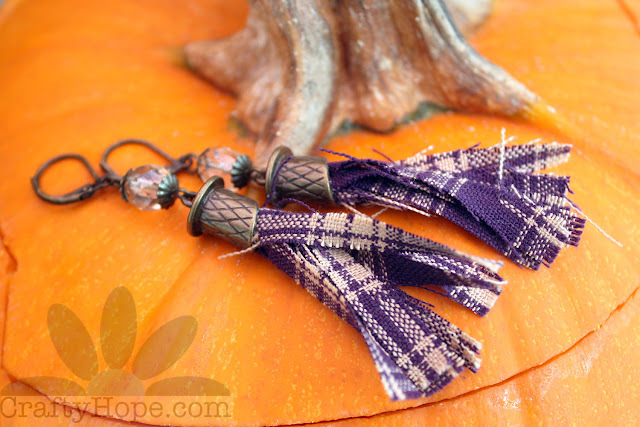 I did mention that I had five plaids, the final one was a purple and tan tartan. I'm not sure where this basic tassel idea came from, but it came together easy-ish enough. Though, I did have to do more exact measuring of the fabric first. Blarg! With two fabric pieces stacked on one another, I snipped them to create a fringe. Then, the pieces were individually rolled with glue and dried to create the tassels. They were then glued into the Industrial Chic hardware. I added the pale brown crystals for a little touch of bling to finish off the earrings. I'm not exactly sure where the next idea came from. I remember doing a little research on plaid, and it stood out to me that tartan simply a pattern of lines that intersect at 90-degree angles. I decided to create my own...on tin. I took a section of the bottom of a cookie tin, painted it with gesso, used a stencil to create one set of lines in green and then the second set in blue, then sealed the tin with a varnish. I figured that I had already made two pairs of plaid earrings, this one would be an "extra" anyway - why not go all out with the creativity and experimentation. As I began forming the hoop-shape, I realized that I could hang a bead in it so that from any angle the earrings are still interesting. 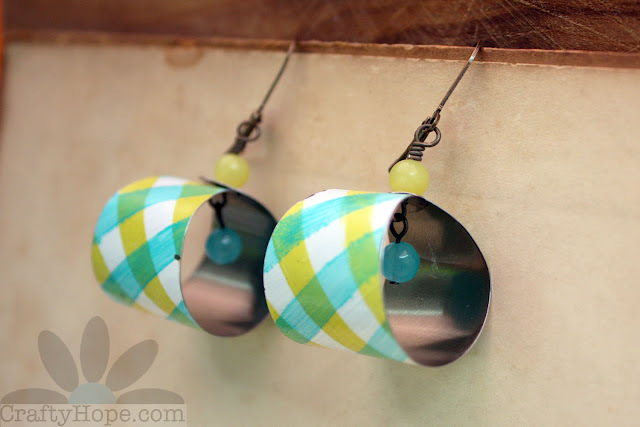 I have to say that I really love this design - the plaid, the shape, the colors, the hanging bead, the tin - it's all awesome. I will be making more! I wasn't positive I would get this last design completed. The word "woven" stood out to me in Erin's challenge description, and I wanted to create my own weave somehow. Embroidery came to mind first so I went with it and was working up until yesterday to get this design done. Totally worth it! The weaving portion took me two tries, and it's still not quite right (they don't match exactly), but I love them! Once the embroidery portion was done, I backed the fabric with felt. However, it's the leather tops that that really steal the show and raise them up. 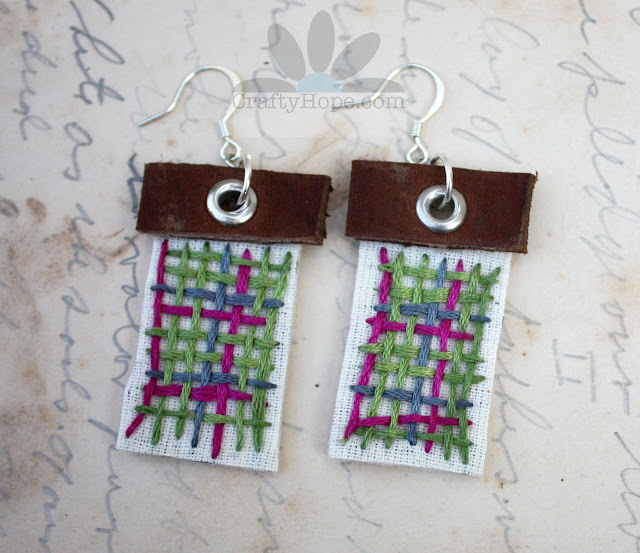 Yes, the plaid isn't all that great, but I adore these anyway. 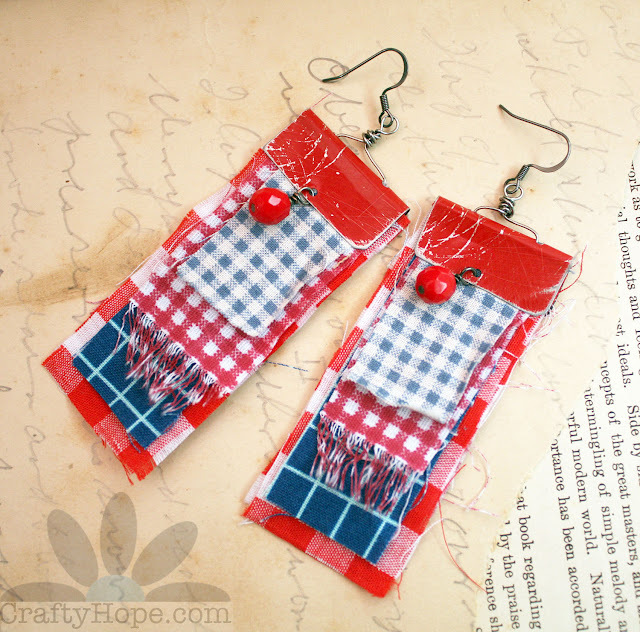 I can't believe how much I was able to do with plaid and how much it inspired me. Now, please head over to Earrings Everyday to see what the other designers did with the inspiration. 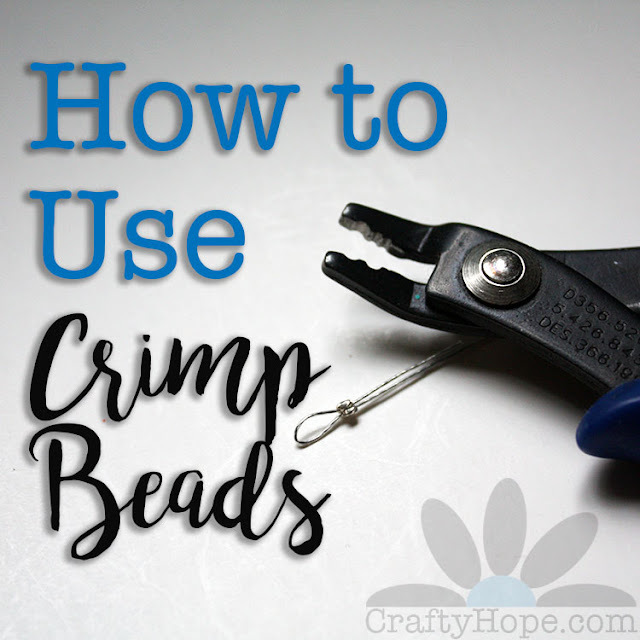 I'm also sharing this post at the following link parties: Sweet Inspiration, Flaunt It Friday, Dare to Share, Saturday Sharefest, Snickerdoodle Sunday, Craft Schooling Sunday, Nifty Thrifty Sunday, That DIY Party, Made by You Monday, and Inspiration Monday. These are all supper fun Hope! 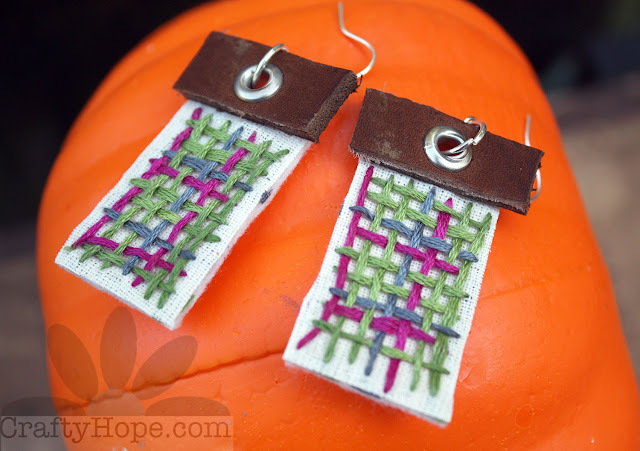 Great ways to utilize small pieces of fabric. 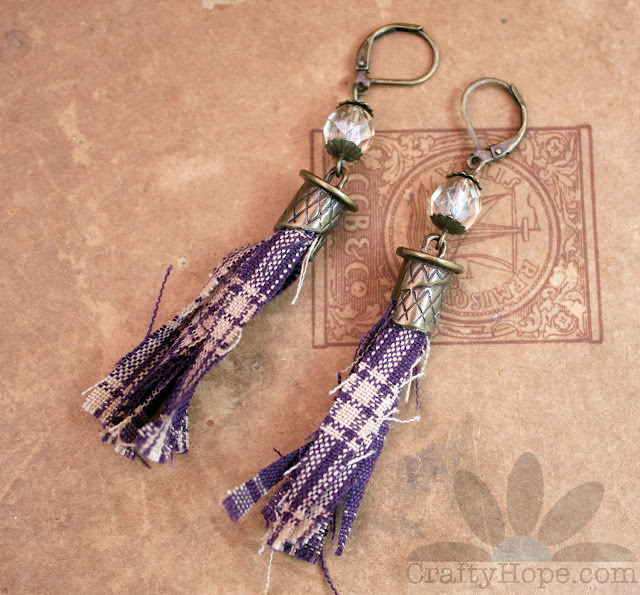 I love the tassel earrings. 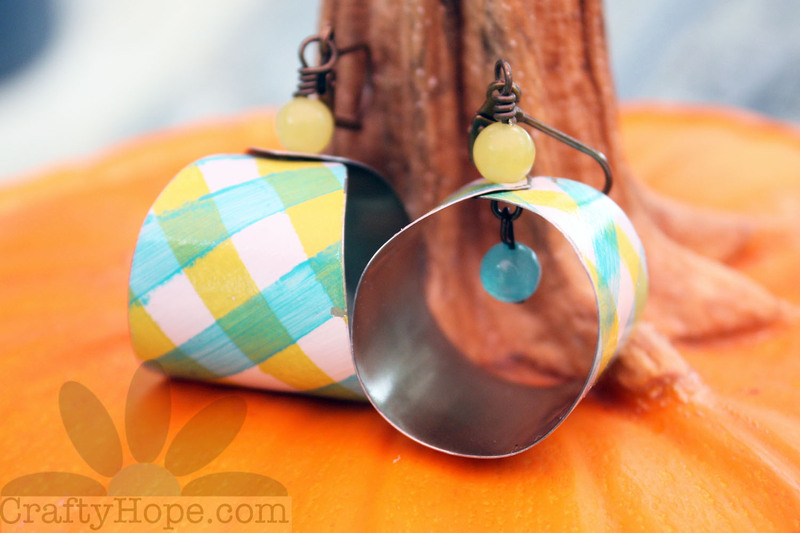 Your idea of using the bottom of a cookie tin to create your own plaid--brilliant. 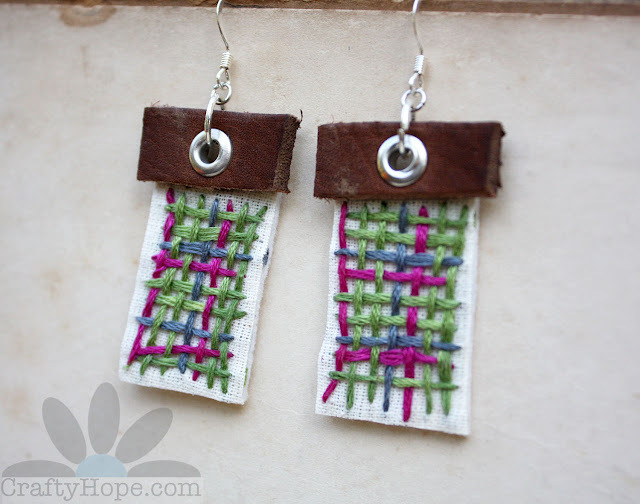 The idea of weaving thread is inspired also. I love them all. Kathy, Thank you so much. I'm still ultra surprised that I was able to make so many design with such a simple prompt. I think that the simplicity of the idea is really what did it for me - it left open a world of options. I can't wait to take these ideas and run with them a little more too. Thanks for hopping by! Way to take an idea and run with it, Hope! Stacking the fabrics was inspired, but those clever tin and tassel tops are icing on the cake. So fun! 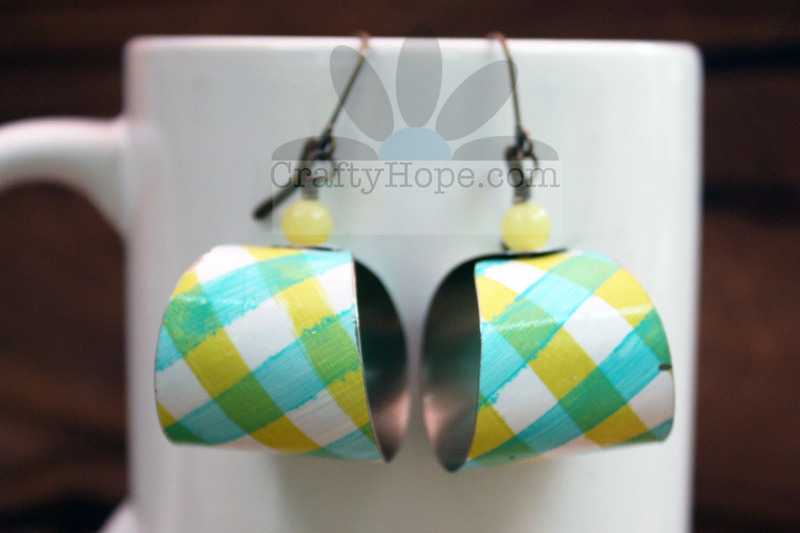 I really love the plaid you painted on tin... it's so adorable! You were super inspired this month and explored so many fun directions. Bravo!! Wow, an overload of inspiration! The tin hoops and the embroidered one are my absolute favorites! 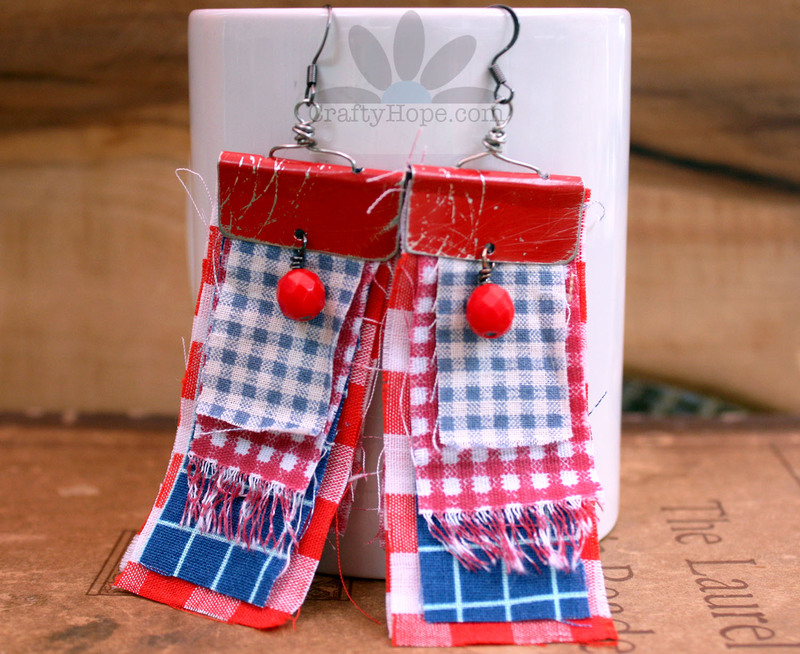 I love all the ways you found to use plaid! I especially love the tin - I thought that was a pre-printed design and am fabulously impressed that you made it. 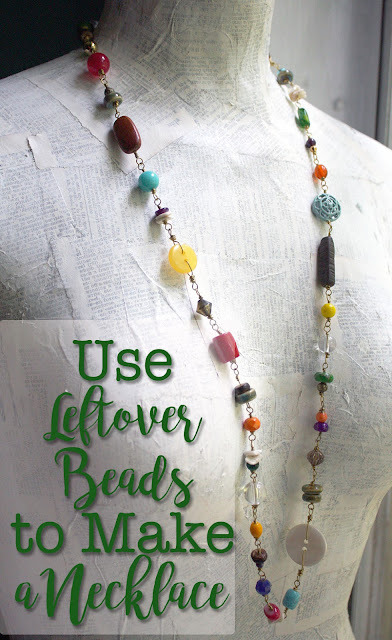 I also love the bead hanging in the middle so there is interest from all angles.